We have some of the finest African theme event entertainers available in the United States. An African theme event or Safari themed party comes alive with traditional African music and dancing. 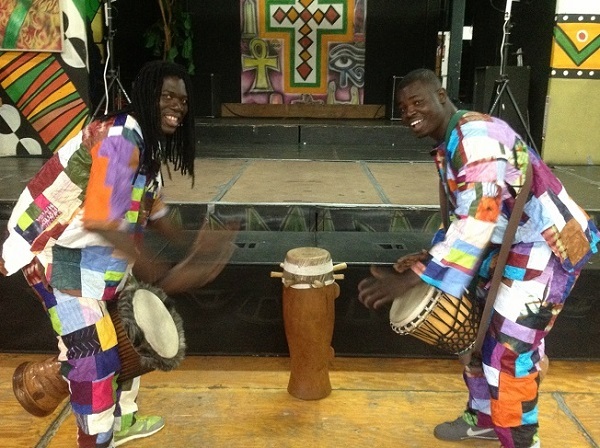 These entertainers are experts in regional African music, drumming and dancing. They will teach your guests African drumming and make live music while the beautiful and talented female dance instructor has your guests learning the moves and getting the whole room moving to the beat. Call us about African themed entertainment available and African decorations for rent and also Exotic African Animals for rent for your special event. See African Animals at a Safari Themed Party we produced. We are experts at producing African themed and Safari themed events. The African Drum and Dance Experience can be enjoyed at any event. This unique musical encounter offers a beautiful way for children, young adults and families to find their rhythm, reconnect, and grow together through storytelling and drumming, West African style. 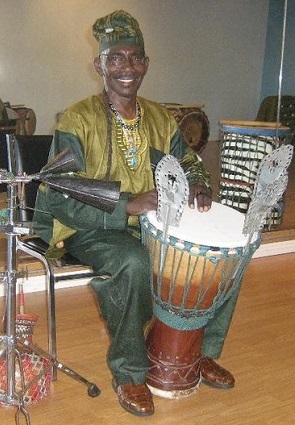 A life-long musician and master drummer with roots in Ghana, our drum troupe leader, Nana shown at top, has found purpose and passion through sharing the music and stories of Africa.